I've been changing oil in my 2008 C6 since I bought it new. I struggle every time when I drive up onto three stacked 2 x 12's on the left side. There just isn't enough clearance to conveniently reach the filter. I've decided I've got to take a different approach than I have been. I would like to use a floor jack & puck to lift just the front left side far enough to set the left tire onto a ~10" metal ramp. I would then move the floor jack out of the way until the job was done. Would it be OK to jack the car up just on the one side high enough to set the front left tire down on the 10" ramp? Would that be a safe and stable thing to do? If that is too high, how high could I go? I just want to change the oil and filter. Probably 8" would be enough. I know 4 1/2" isn't sufficient. I'm not sure I would like to do it way, because the car will be tilted and possibly loss of traction on the rear wheel of that side as well. I personally raise the front high enough to put jack stands on each side of the front. I use a cross beam adapter on my long reach jack to jack up the front. Get a 1.5 ton hydraulic jack from Harbor Freight for under $60.00. Then get a pair of 3 ton jack stands from Harbor Freight of about $24. Use your jacking pucks to lift he car from the side on the puck location and place the jack stands under each side at the location shown in your owners manual . I have been using this method for about 12 years now, fairly inexpensive and works great. True. I did look at the cross beam adapter that Harbor Freight has. I would have to buy a floor jack (3 ton?) and the cross beam adapter. I suppose I could use the floor jack and the cross beam adapter to set both front tires on to my metal ramps as opposed to using the jack stands. That should be OK, right? Are the lift points for the cross beam adapter difficult to find? You are saying you lift both front tires off the ground, right? And how high are they off the ground? I made small ramps out of 2x12. Two boards high. Then there’s room to get a jack under the engine cradle. Jack it up until I can get a ramp under each wheel then set it down on the ramps. Plenty of room to get the filter and oil plug. You could also use a few 2" x 12"s in front of the ramps to decrease the angle and just drive up onto them. Before I got my lift that is the way I did it on my GS. Make a 4 or 5 board ramp. Best if you can move the first couple/three after it's up so they aren't in your way. Mine is 3 boards and it works for me, but might not for you. This is exactly what I do. Works perfectly. Bought a low profile long reach jack and the crossbeam from Harbor Freight. The car is then very easily lifted by placing the crossbeam under the front of the car, right under the first large metal engine / frame support. But the key to the whole thing is to buy a set of "Race Ramp Trak Jax" on Amazon. This is a set of small ramps that weigh about 2 lbs each and lift the front of the car about 3 inches when you drive up on to them. They are made to raise the front of a sports car so a jack can easily be slid underneath. They are so small and lightweight they actually fit in the trunk of the Corvette. These ramps cost about 90 bucks but worth it . . . so quick and clean and easy. Forget the homemade wooden ramps. Once the car is on those ramps I easily slide the jack and crossbeam underneath, lift the car, pull out the small ramps and put in the taller metal ramps. Lower car onto the metal ramps, change oil, and reverse. Of course you have to be accurate when placing the ramps under the wheels while the car is in the air. And of course lower the car onto the ramps SLOWLY. Last edited by csf; 04-09-2019 at 11:52 PM. To just change the oil, I crawl under from the front. I'm 5'10" 180 pounds though, if you've got a big beer gut or something it might not work. LOL @ that oil drain pan. It's a plastic wash basin I bought in the late '60s. They hadn't invented the modern drain pans yet. I simply turn wheels to the right,place a puck under drivers side rocker, jack up car and change the oil. No wood planks needed. I've always jacked up the side of the car and placed a jackstand to support when doing oil changes. I've found I can reach it with my arm without having to climb underneath. I always put wheel blocks down to prevent rolling. Been doing this on my camaros and vettes for years, though only with subframe connectors on the camaros due to the unibody design. Last edited by WW7; 04-10-2019 at 05:33 AM. Get some “leave in, permanent” jacking pucks, a decent floor jack, 4 jack stands and learn where the jack stands go. Every time I wash my car I take the wheels off. Takes no more than 3-4 minutes to get the car up in the air. Honestly it takes longer for my compressor to build up air pressure than it does to get the car off the ground. Once it’s up and level you can drain the oil and feel safe working underneath. I jack up by front jacking points high enough to get the jack stands under front and rear at the same time per side. Super easy and you’ll be comfortable with it after you’ve done it a few times. I just drive my GS up on a set of ramps. I place a 1X6 piece of solid plastic house trim (left over scrap) at the bottom of the ramp to keep from dragging the splitter on the ramp. Works like a charm. Thanks everyone for taking the time to explain how it's done. Obviously lots of great solutions. I'll be ready the next oil change time! getting ready to do the first oil change on mine since I got it. Does jacking up the driver side help drain the oil out? I remember. On the camaro when I put it on ramps where they put the plug all the oil couldn’t drain out. Really odd design on it. I place a wood block behind passenger side rear tire to prevent the chance of roll back, trans in gear with hand brake on. Install puck under driver's side and jack car up. Place one 3 ton jack stand under car for safety. Crawl under car and remove oil pan bolt and oil filter. 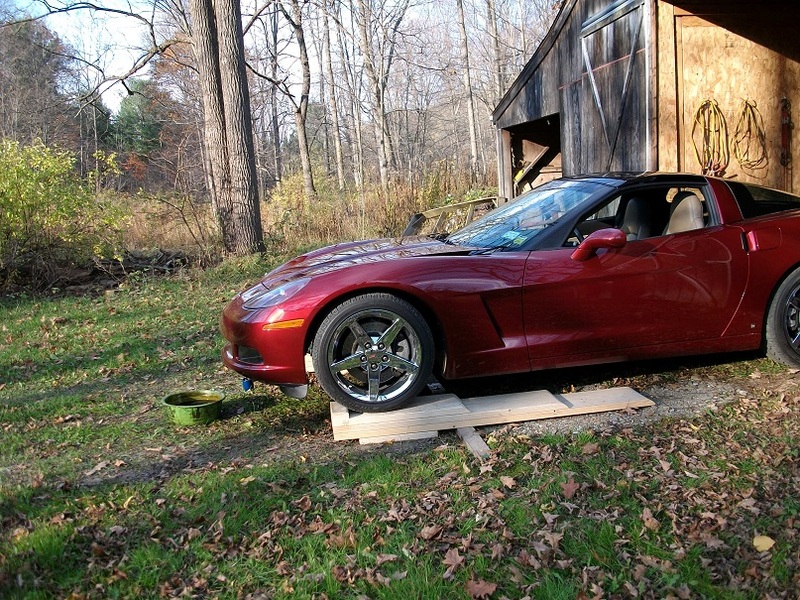 Remove jack stand and drop car back down so it is level, allow oil to drain. Repeat to install oil pan bolt and oil filter. Drop the car down and I'm done. 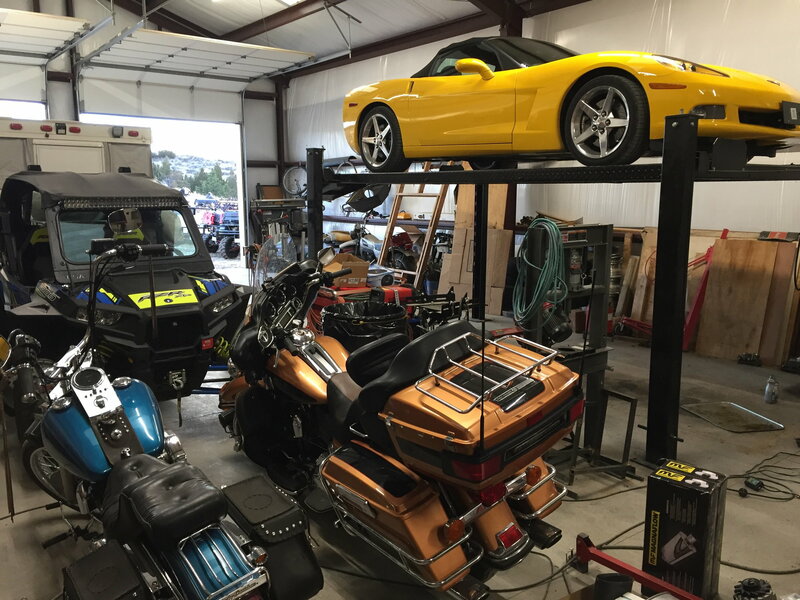 The corvette is designed to be lifted safely when the jacking points are used. Last edited by Mike's LS3; 04-10-2019 at 10:24 PM. So you just jack up one side of the car using the left front puck position. How high does the front tire get off the ground? And do the other three stay on the ground?